We finally worked up the courage to try grooming Teddy ourselves today. We’ve had all the tools necessary since before we left Canada but we both lacked a little courage in shaving the little monster. There are several Tiffin owners at Allegro Campground who groom there own mini schnauzers and they basically told us how to do it, plus we also watched some videos on YouTube that were pretty good. Teddy was a good boy. We set up a towel on the dinette table and went to town with the clippers and scissors. We went slowly enough for Teddy to feel comfortable and made sure we had lots of treats for him being such a good boy. He was looking pretty scruffy around the edges but looks pretty good now and we are pleased with our first effort. We still have to trim the skirt a bit as well as his legs and ears but it wasn’t as difficult as we thought it would be. Of course, if anyone laughs at the job we did when we next take Teddy for a stroll, we’ll just sic the little monster on them……kidding of course. He’d just lick them to death anyway. We took a run into Florence, Al on Thursday afternoon….more just to get out of the campground than anything else. We picked up an LED bulb for our small table lamp at Lowe’s. 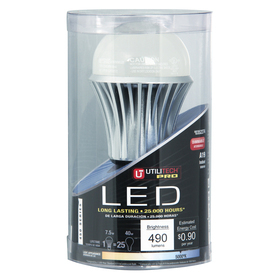 This thing is good for 25000 hours, uses 7.5 watts of electricity and puts out 490 lumens of light….whatever a lumen is. All I know is it gives off plenty of light for reading and never gets hot like the old CFL bulb did. It was marked at almost $20 on the shelf sticker but it was only a little over $10 at the register. I know, I know….pretty expensive for a light bulb but it should last for years and use less than $1 of electricity annually according to the packaging. After Lowe’s, we made a quick stop at Best Buy to pick up some more ink cartridges for our HP printer. We don’t print much in color ever but the printer seems to look for full ink cartridges even when just printing in black & white. Lately, we’ve been doing more scanning of documents than anything else and just emailing them wherever they need to go. Scanning has certainly come in handy for Chris dealing with all the various government departments as she sorts out his estate and also her realtor when responding to offers on the house. We received a call from Jimmy Oliver at Tiffin on our way back to Red Bay. Our wet bay floor will be replaced on Monday now and we have to be at Bay 44 for 7 am that morning with our tanks empty. That should take care of the rest of our list, so we are hoping to be on the road out of here on Tuesday morning and expect to arrive at Thousand Trails in Orlando sometime Wednesday afternoon…just in time for Thanksgiving. If the weather is half decent on Sunday afternoon, we may have Phaeton Place washed and waxed by Ricky Johnson. Forecast is for thunderstorms around Red Bay for Sunday through Tuesday though, so we may wait until we get to Florida. Can’t see paying for wash and wax if we’ll just get dirty again right away. This entry was posted in Alabama, Maintenance, Pets, Phaeton, Technology. nice work on Teddy’s first hair cut! !..how did you get him to hold stil? ?